P0769. 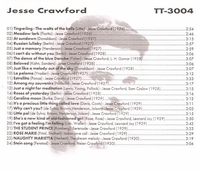 JESSE CRAWFORD (Wurlitzer Organ): 24 Jesse Crawford favorites. (Germany) Truesound Transfers 3004, recorded 1926-30. Transfers by Christian Zwarg.